Line a 25cm square baking tin with greaseproof paper. Melt chocolate and butter in a bain marie. Add the nuts. In a separate bowl, mix together the cocoa powder, flour, baking powder and sugar. Add this to the chocolate. Beat the eggs and fold in until you have a silky consistency. 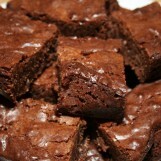 Add your brownie mix into the baking tray, and place in the oven for around 20 minutes, or until squeegee in the middle. Eat warm straight out the tin. Or leave to cool and cut into 12.